Shikanoko has been humbled by failure, and his once clear destiny has become clouded . . . The Autumn Princess and the boy who is the true emperor are fugitives in the forest, alone and unprotected . . . In the mountain sorcerer’s hut a new generation of the Old People is born—the Spider Tribe, not quite human, not quite demons, and quickly coming of age . . .
One clan is in retreat, the other holds the capital, and natural disasters follow one upon another. Will Heaven ever be placated? 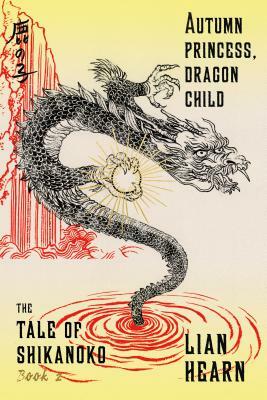 In Autumn Princess, Dragon Child, the old order has come unsettled and the weave of destiny has become unpredictable as it is pulled tighter, sharper, faster, by the instincts for vengeance and redemption, loyalty and survival. The battle for the Lotus Throne has begun in earnest. In this medieval Japan of Lian Hearn’s peerless imagination—so full of magic, beauty, violence, love, and sorrow—the only thing truly inevitable is that these forces are building to a brutal climax, though who the players will be and what the stakes will be cannot yet be told.